One summer morning at 4 am, four Californian birders walked through the Philadelphia National Airport, thirsting for a new experience. I, being one of them, was very excited and could not wait for the wonderful week that was about to begin. After meeting and chatting with the campers, we boarded the first van and stopped several times on the way to Delaware City, encountering many birds, most of which were lifers for me, including Fish Crow, Least Bittern, and Purple Martin. Our instructor then drove us to the American Birding Association Headquarters, which I had been looking forward to visiting for a long while. When we arrived, I looked out the window to find a large and elegant brick building, surrounded by an active city. Dragonflies took off to the morning skies, mushrooms dotted the lawns sprinkled with dew, and sunflowers were carefully watered by a neighbor, as a small stand of fresh vegetables and fruits stood under the trees buzzing with cicadas. We then made our way to Lewes, a beautiful city in Delaware, where we met the remaining campers. All of them were birders, some also passionate photographers and others active eBird listers. 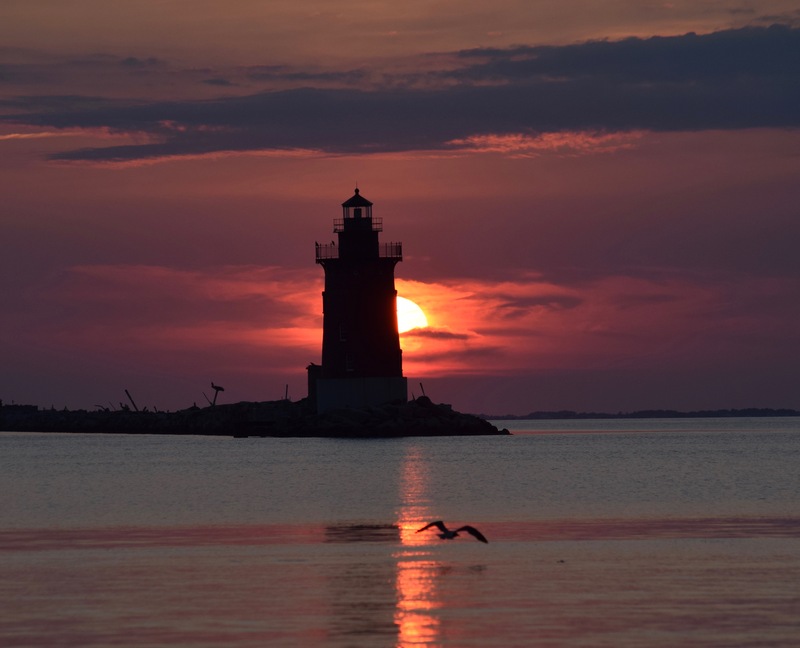 Soft sand gathered between our toes as we walked down the shore, and the crimson light of the sunset was almost blinding behind the silhouette of the lighthouse. The ocean waves slowly covered up delicate footprints left by many kinds of shorebirds, which were surrounded by ghost crab burrows and a variety of seashells. I lowered a spotting scope down from my aching shoulder, and scanned the far side of the shore, observing a rare Great Cormorant, as well as American Oystercatchers, Piping Plovers, and Sanderlings. The fresh ocean breeze calmed down and nighthawks suddenly appeared, their calls awakening me from my jetlag-induced drowsiness. That night, after much laughter and plucking of guitar strings, the air conditioning provided some relief from the warmth and humidity, and we slept peacefully through the night. In the morning as we drove to Bombay Hook National Wildlife Refuge, we stopped a couple of times to observe the roadside wildlife. Semi-palmated Sandpipers huddled in the marshes by the hundreds, in an environment shared with Gull-billed Terns, Glossy Ibises, Snowy Egrets, Greater and Lesser Yellowlegs, Marsh Wrens, and dowitchers. I began to realize what a great group I was part of; the birders were very talented, some of which had travelled many places and had interesting stories to share. 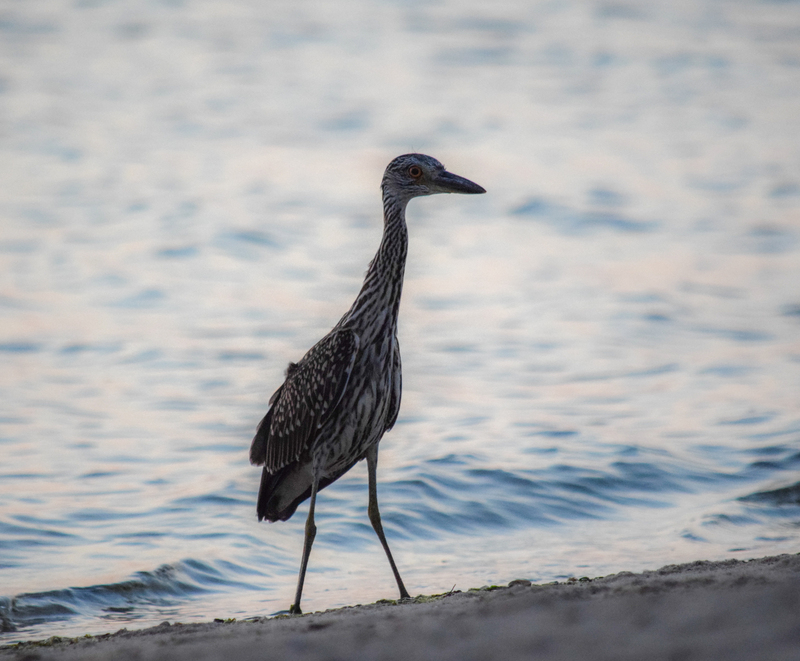 We later returned to Lewes and birded along the shoresof Cape Henlopen, and as night slowly approached us we skipped rocks towards the sunset. A very appetizing dinner was served, and we all settled in our rooms for some well-deserved sleep. I walked out of my dorm room the next morning, and looked pensively at the clouded sky. We scanned the roadside at Prime Hook National Wildlife Refuge, and got some quick looks at a Lesser Black-backed Gull before the rain began to fall. Richard Clifton, a fantastic bird illustrator and a frequent winner of the annual duck stamp contest, kindly invited us into his home to look at his paintings and listen to his story. Incredibly realistic paintings hung on the walls of his living room, the sort of art you would call perfection. We then headed back to participate in our evening activities, which included a bird ID quiz on many species of ducks. Through our teamwork we answered nearly all the questions correctly, and the instructors handed out Crossley ID Guides, all of which were signed by Richard Crossley himself. The next day was a big day: we woke up at 5 am and boarded the vans for a two-hour drive to Chincoteague National Wildlife Refuge in Virginia. It was wonderful! 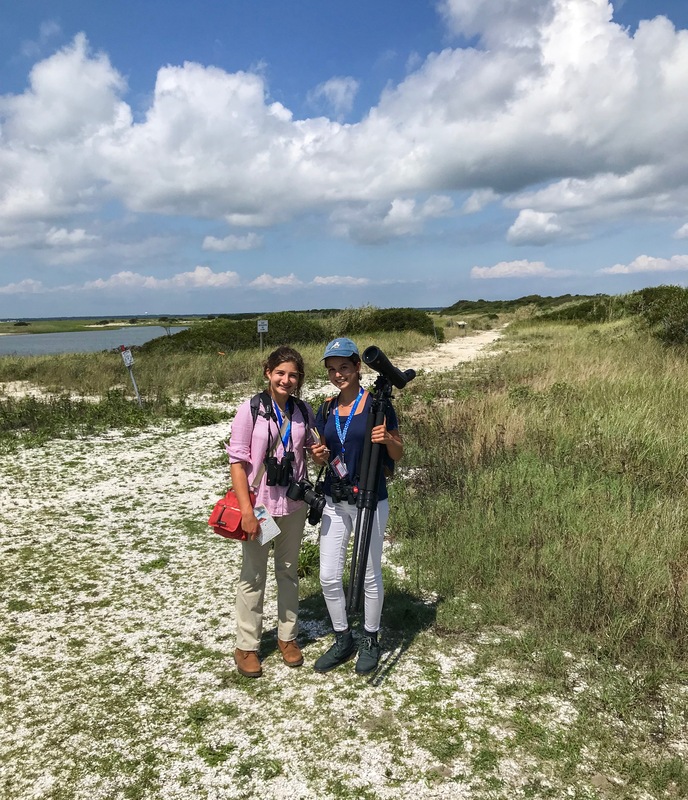 We found all sorts of wildlife – from wild ponies roaming freely through the grasses, Sika Deer feeding in the fields, and turtles crossing the road, to a Red-headed Woodpecker foraging, Yellow-billed Cuckoos flying through the forest, and much more. I stood and looked around, admiring the absolutely gorgeous scenery. The next morning, we climbed aboard a ferry, which took us to New Jersey. There, we spent the rest of the morning in Stone Harbor, where I began to get a feel for scopes and how to handle and use them properly. I was walking barefoot by the water and holding my boots when all of a sudden something stirred the water beside me. Cownose Rays! All of us stopped to observe and admire their presence, for it was quite a rare occasion to see such a large group, of around thirty individuals. I observed a lot of bird behavior that day as well, as there was a large nesting area of Black Skimmers and terns feeding and tending to their young. We did some quick birding in beautiful Cape May for the afternoon, and drove back to board the ferry again. The salty ocean breeze blew against our sun-kissed faces as a pair of Parasitic Jaegers chased the sunset by the boat, which rocked back and forth. I opened my screen door the next morning to find a cicada gripping tightly on to the mesh. The sun was rising slowly behind its profile, so I walked down the path to a welcoming breakfast. We then rode to Cape Henlopen State Park, where the Big Green Hour took place. The Big Green Hour is an annual Camp Avocet competition where an instructor divides us into groups, with four to six campers and one instructor in each team – and the challenge is to find as many birds as possible in that hour. We birded the time away with observations of Pine Warblers, Green Herons, Orchard Orioles, and multiple shorebirds. The biggest number of species a team observed in that hour this year totaled sixty-two, which equaled the previous record! After taking a moment to hydrate under the blazing sun, we explored Prime Hook National Wildlife Refuge again, and this time I focused mainly on the frogs and mushrooms I found on the side of the road. A few campers with a curious eye for fungi accompanied me as I stepped over tree stumps and wilted leaves, encountering some beautiful Amanita species, which are part of a genus of fungi known for their toxicity. The fresh aroma of pinecone spice lingering in the forest came to my consciousness as the paper white caps of the toadstools stood out from the dark shadows. Afterwards, we got into the “cool van” and listened to 80’s music all the way down to the beach. Our time there was one of the most memorable moments of camp; it was crazy fun to hang out and swim with our friends. We did all sorts of activities: from burying people in the sand, to chasing them around in the water, to playing frisbee – it was all very enjoyable. Later that evening, I sank into the van seat and looked at the passing trees through the window, sighing as I remembered that it had been our last full day at camp. The next morning, goodbyes were said and hands waved as our first van departed Lewes. I stared out the window, thinking back on what a great camp it had been, the memories we had made, the things we’d learned and experienced. It was an absolute pleasure to be amongst birders my age and to be educated by experienced instructors in a state I had never visited. The East Coast has a special place in my heart – I fell in love with the architecture, the old-fashioned houses, the wildlife, and most of all, the vivid green landscapes. I would like to thank the Central Valley Bird Club for making this fantastic trip possible; it has taught me much about the wildlife of the East Coast, shorebird identification, and teamwork. On my way home from the airport after a long flight, I smiled as I remembered I had brought a four-leafed clover that a camper had found in the lawn. Resting between the cardboard layers of my flower presser, a little piece of Delaware came home with me.